Dairy brands have a product that might not scream "viral" to senior management. So how can social marketers at dairy brands justify increased ad budget? We dove into the industry to find out exactly where and how the best-performing social marketing dairy brands are getting their value. Dairy brands post more than 13 types of content, some of which work uniquely well with their audiences. 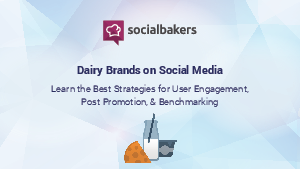 By using Socialbakers Analytics, we were able to identify the most effective content strategies for dairy brands, find the most effective ways for dairy brands to promote their content, and deliver recommendations for increasing ad spend efficiency and effectiveness.